Explore our summer sessions, retreats, and other PSGW sponsored events. PSGW runs three independent, one-week-long sessions each year designed for adults ranging from bare-bones beginners to professional musicians and singers. The teachers and classes are different in each session and although there are a number of classes that will always be given (e.g. beginning guitar), each week develops its own character based on its unique teachers, classes, and students. You can explore each session's classes and instructors by clicking on the links below. In addition to the summer Guitar Workshops, PSGW holds three music retreats throughout the year. Retreats are a time when the camp community can come together to play music without as much structure as summer camp. There are no teachers or classes, just relaxed fun and plenty of music jamming. Usually the smallest of the three retreats. Enjoy an intimate gathering of musicians as the sunlight returns. There is an option to attend for three or four days. Ring in the New Year at camp! Attend for the entire camp or options available for a shorter camp stay. Reconnect with community in the middle of winter! Held over the long President's Day weekend, this retreat tends to be the largest of the three. A summer camp for adults devoted to curiosity, creativity, and kindness. Everyone's a teacher. Everyone's a student. For all writers - the shy, the curious, the experienced and the intrepid alike. Share the weekend with great teachers and fellow writers, good food, and beautiful surroundings. Over the years, PSGW has inspired the start of many other music-related events. Here are a few camps with strong ties to PSGW, but are their own unique camp experience. Held in the same location as PSGW, Summer Acoustic Music in the Pines (SAM Camp) does not have any classes or workshops, but rather focuses on playing music and jamming. 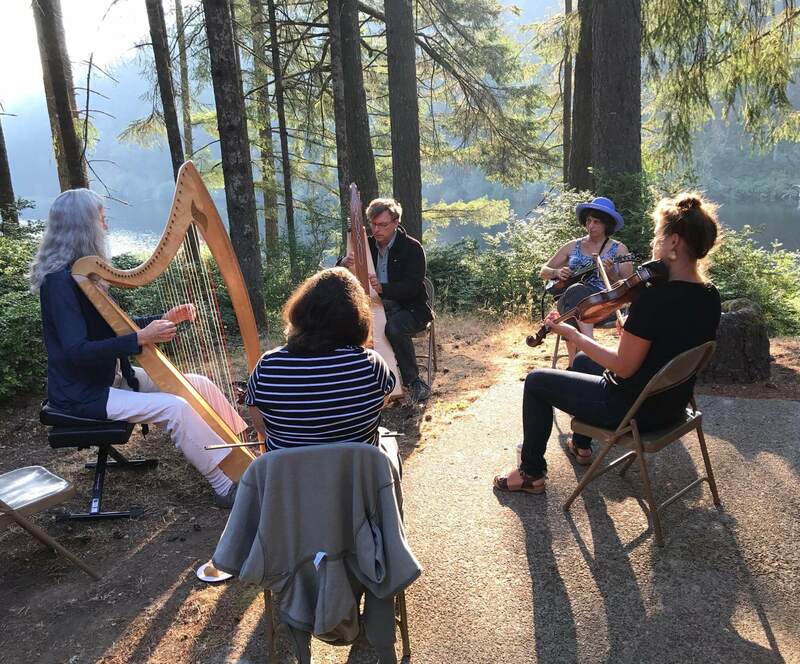 If you'd like to make music with friendly folks in a beautiful setting or just find a quiet spot to compose, practice or just relax there is no better place. Similar to PSGW, the California Coast Music Camp (CCMC) runs two independent, week-long sessions each July with beginning, intermediate and advanced classes for adult musicians, including singers.